Oil and oil changes have always been a sensitive topic for E46 M3 owners. The model broke from tradition by having a new oil requirement (10W60) along with BMW's new specs for 'extended life' oil services. The situation was not helped by a bad batch of rod bearings (initially blamed on the wrong oil choice) and horror stories of improperly trained service techs using the wrong oil. Oil filters did not escape controversey and it continues now. This page will hopefully shed some light on the differences in the catalog listings for OEM oil filters. Both Mahle and Mann brands make all kinds of filters for BMW and other car brands. They have both earned OEM status and have provided years of quality products. Both, or either, are recommended for specific applications. For the S54 oil filter, however, the one true OEM is Mahle and there are considerable differences between them. The Mahle uses a perforated paper band around the filter and metal caps at both ends to help maintain its shape and the uniformity of the pleats. The Mann does not use any band or end caps. The Mahle filter comes with a perforated metal core. The Mann uses a ribbed plastic inner core. On construction alone, the Mann appears like it would flow better and the plastic will not retain heat like the Mahle's metal pieces. Because it doesn't use metal, the Mann is friendlier for the environment. The inner rubber seal on the Mahle is smaller for a tigher seal inside the filter housing. That doesn't tell us the whole story of course. The pleat material plays a huge role in filtration. Unfortunately, we don't have data on the pleat material differences at this time. 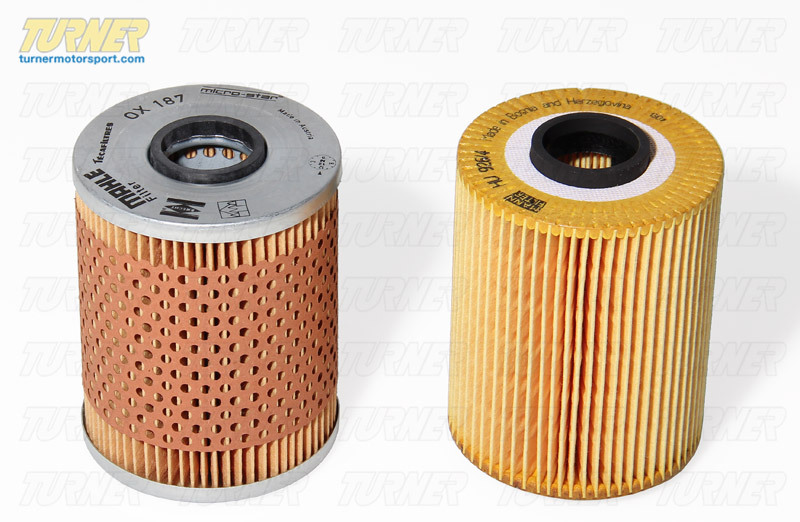 Since Mahle is the true OEM for this filter it matches BMW's spec for extended oil change intervals. The Mann does not carry the OEM designation here and may not be suitable for the same interval. But if you're changing oil every 5,000-7,500 miles the material differences are probably negligible. Advantage: The true winner here would depend on the pleat material. Without that factored in we have to score it for Mahle. The Mahle fits the same as the stock BMW filter. The Mann filter is a little taller than the original stock or Mahle filters. This makes it harder to install and requires a bit of force to get it past the S54 intake manifold and more force on the cover to fully seat it. Mahle kit comes with the filter, housing cap o-ring, retaining bolt o-ring, retaining bolt aluminum washer, copper drain plug seal ring. Mann kit comes with the filter, housing cap o-ring, retaining bolt o-ring, retaining bolt aluminum washer, aluminum drain plug seal ring. The aluminum seal ring is designed to crush at a certain torque and help lock down the drain plug. Have you ever heard of a drain plug backing out? Neither have we. Both brands are similarly priced. The cheaper one has always tended to be Mann but the difference is so small as not to matter. Especially on an expensive engine like an S54. Advantage: Mann, but it's close. Both filters have their merits but given one choice over the other we have to prefer the Mahle. Given that both are nearly equal in terms of performance, the Mahle is a winner on fitment and OEM status alone. There's nothing wrong with using the Mann HU926, and we have been using them on customer and personal M3s for years. But by executive decision we prefer the Mahle brand. What about Mahle OX68D vs OX187? The Mahle OX68D was a very common filter replacement early in the E46 M3's life (when the pricey Original BMW filter was the only one available). The only difference between an OX68D and an OX187 appears to be the pleat material and the number of pleats. The OX68D has 63 pleats vs 69 for the OX187. And Mahle has said that the material is an 'upgraded' type to meet BMW's extended oil change intervals. With that information it seems reasonable to say that the OX68D is safe to use with more frequent oil changes (5,000-7,500 miles). As a company policy, however, it's best to recommend the OX187 as the true OEM replacement for the S54 engine.